On the 15th February, HARDtalk repeats an interview with former Lebanese Prime Minister Rafik Hariri who was killed in Beirut this week. 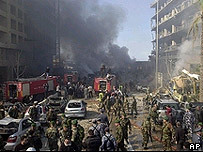 Rafik Hariri and 14 other people were killed in a car bombing in Beirut on Monday. A bomb blew up close to Hariri's motorcade injuring about 120 others. Tim Sebastian spoke to Mr Hariri in November 2001 when he was still the country's prime minister. They talked about the war on terror, the situation in the Middle East and relations with neighbouring Syria.